Today was my first successful thrift outing with kids in tow. After our doctor's appointment we stopped by two of our favorite shops. It was so fun! Many of the workers, having seen me pregnant for the last few months, were so sweet and oohed and ahhed over the baby. I found this boutique Jacadi outfit for $1 and a brand-new NoJo Original Baby Sling. I have a 50-cent yard sale version already, but I wanted a second one to keep in the car. Getting out of the house for an enjoyable morning was worth every penny! I had to nurse between stops, so I detoured to Watkins Park and let Andrew run through the amazing array of misters and fountains at this free city sprayground. A question for moms who have used both this sling and the Maya Wrap: is the latter truly more comfortable? The NoJo is comfy, but puffy, when compared to the sleek new slings. If the difference is simply cosmetic, I'll stick with what I have, but if the Maya wrap is better, I'll keep my eyes open for another. I used both slings. I really think it's a matter of personal preference. I didn't like the puffy rails on the NoJo type slings as much. I found them more cumbersome, and less flexible. I also think it's easier to nurse in a Maya, once they get a little older. However, I nursed in both types many, many times. When I had my son and had to get a new sling, I only bought a Maya. I even paid close to full price for it (on eBay). My husband felt even more strongly that he didn't like the padded rails, and he is a big baby slinger. A Maya is more flexible once the baby gets older. I used mine as a blanket, as a changing table, I tied it around my son's waist a time or two, and I have used it as a sunscreen. They are also easier to slip off and make the baby comfortable after they fall asleep in the sling. I do think that padded slings are slightly easier with a new baby. 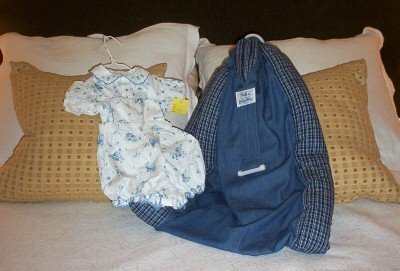 I wore mine "backward" and put the baby's head on the shoulder pad like a pillow in the newborn stage. It gave both of us some extra support. Of course you can also use a small folded receiving blanket and get the same effect. Bottom line, if you like the sling you have I wouldn't worry. If you see a Maya you can get at a reasonable price or get a chance to try one, definitely do so. You may find the NoJo less comfortable as Elise gets older/heavier. AS the prior poster said, if you like it, it works for you, you don't need something else! I HATED the Nojo, and by extension, all slings. The padding , in particular got totally in the way--I could never see my baby. It helped only slightly make the shoulder comfortable. I can't stand carrying all that weight on one shoulder. Thankfully, I found other baby carriers that I adored and they work wonderfully. First, the backpack syle Ergo, then the Mei Tai which is the only one I use now. Both can be used front or back and distribute the weight across both shoulders as well as your hips. The other cool thing is that they can be used for much heavier toddlers/preschoolers as well. (My 19 month old is still only 22 pounds, so I'm betting I'll be able to use mine till she's 4. Not that I plan to carry her around much at that age however!) If I could afford it, I'd also have a wrap--not a Maya Wrap which is a sling--but a real wrap that's a very long piece of woven cloth that you wrap around you and the baby. They look ultra comfy to me and allow for so many different positions of the baby. There are lots of other alternatives to the Maya Wrap, the Ergo, Mei Tais. There's a great site with reviews from parents at http://www.thebabywearer.com/ You have to create an account; I've never rec'd spam via this site! And it helped me find the Mei Tai that I adore so much (as well as a related object called a Tai On One). I have no idea about the baby carriers, I just wanted to rejoice with you about a good day being out. It's lovely to be at home with your home and family, and then it's lovely to get out with the kids on a beautiful summer day! I had a different padded sling, but after I tried a Maya Wrap, I never went back to the padded one. I like the Maya about 200% better. I'll be happy to lend you one for the next several months, if you'd like to try it. I have two and won't need either until about October. I've tried both, like them both for different reasons. For young baby I found I couldn't snug the nojo up enough to get a secure hold for baby and to properly distribute the weight for me (it felt as if I was carrying baby with a necklace, rather than across back). But older I liked the padding for me. The advantage of the maya is the flexibility of positions, especially nice when baby is a bit older, but useful now if baby doesn't seem to like the position the nojo allows. My son liked the upright position similar to baby bjorn but wanted to be off-center, with his head on my shoulder: only the maya allowed that. I've had a chance to teach several mamas how to use slings and what I tell them is that the best position to start with is the one the baby prefers when held simply in arms (i.e. cradled, over shoulder, etc). Good luck! Sounds like you, Elise & Andrew are doing great. I have both and I like the maya waaaay better. The only thing I do like about the NoJo is the sholder padding. But the NoJo never gets tight enought and I find it harder to nurse in. I see on maya wraps website they are now selling a sling that has padding in the sholder only the rest of it is the same as the old one. Another big vote for Hotslings- it is wonderful! I have a lot of back problems and the other slings just didn't fit me right. I am petite and they were just way too big for me. The Hotslings are made to fit you- no adjustments, cute patterns, and it folds up into a tiny little thing in your diaper bag. I got mine (clearanced out) at Slingstation.com. Great service and very fast shipping! I have a NoJo and I love it. I agree everyone has their different tastes. My SIL (who also has a daughter Elise) made me a new sling when my last baby was born. She called it a native sling and I am not sure it is the same as the Maya, but similiar from what you have said. Overall I prefer the NoJo, but that may be because I was used to it having already used it for three kids. My husband likes the native sling. There is good and bad to both. I like that NoJo is adjustable I feel like I can snuggle the baby up better and I can still use it with my 2 year old on my back. I like nursing with it better. But it is bulky and I think hot in the summer. The native sling is much more portable. I can fold it up and put it in the diaper bag. It is made to fit your size. It is also lighter and cooler. I miss the padded shoulder though and being able to adjust the sling which for me makes it harder to take off once the baby is asleep and I want to put her down. Elise also outgrew the native sling at about 9 months. If you sew or no someone who does I would recommend finding a pattern and making one to try. I think my SIL just googled to find the pattern she used. It isn't a complicated project. BTW thanks for stopping at my blog the other day! It's easy to make a sling. You need about 2-1/2 yards of fabric at least 45" wide. Keep the fold from when it was bolted and sew up all sides. Attach two rings to one end (you can buy them at slingrings.com) and you have a new sling in your own favorite color and style.